If you have opened Kotak 811 Saving account then you need to complete Full KYC for your 811 accounts within 1 year. If you failed, your account will be terminated. After completing full KYC for your 811 saving account, all restriction will be removed and you can access your account without any limitation. With limited KYC You can deposit up to Rs. 10,000 per calendar month to your 811 Lite account, and hold up to Rs. 10,000 in it at a time. The aggregate of all credits in the account in a financial year should not exceed Rs. 1,00,000/- unless in-person full KYC process is completed. You won’t be able to have a Virtual Debit Card. In case full KYC is not completed within 12 months from the date of account opening no more credits will be permitted. In order to upgrade to a regular Kotak 811 account, you will need to verify your Full KYC details. How to Complete Full KYC for 811 Account? You can complete full KYC at home or by visiting the selected branch. You can book an appointment online and compete your KYC at home. The bank representative will visit your home and complete KYC using biometric or collect physical KYC documents. 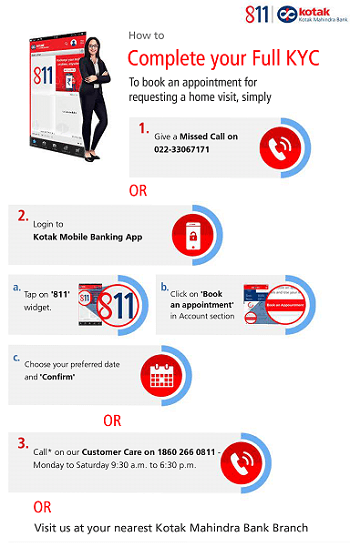 You can either book an appointment through Mobile Banking App or Call Kotak Bank customer care on 1860 266 0811 and schedule your appointment. The Bank executive will visit you to complete the in-person KYC verification. tap on Kotak 811 widget. Select your preferred date and time and confirm your request. You can also visit any nearest Kotak branch with kyc documents and complete your full KYC.